It was months in the making so to see it all come together was very rewarding. 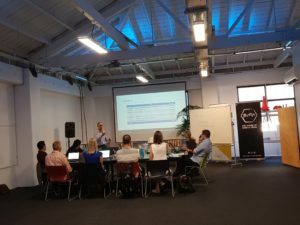 The team at the Blockchain Association of New Zealand put together the framework for the much anticipated Blockchain training course leading to certification with the Crypto Currency Certification Consortium (C4). 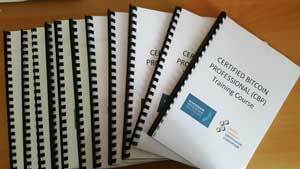 BANZ ran the pilot course in Wellington last week with 9 people registered. Unfortunately one student had to defer the course due to illness. The course was structured in a collaborative fashion where students seated around a table was preferred over the typically classroom type, two to a desk scenario. This provided a less formal environment encouraging everyone to feel comfortable and confident to contribute and everyone did. The students background consisted of people experienced with mining, hardware wallets, tax and cyber security among others. What happened was that these people shared their experience in the appropriate section of the course which contributed to the over all course value. Having something explained from different angle aided the learning process. After the students were given some practise questions under time pressure, they were then asked to split into two groups and formulate questions for the other group. Some of them got really creative! Here are some examples. Could you answer them? A dedicated slack channel was setup to provide support during and after the course. This was very useful particular when the students took the exam and then shared their experience and provided encouragement to the rest of the group. The main awkwardness was having to pay for the course partially with bitcoins. The idea was to get the students to experience the process of doing a real transaction through a QR payment system but it’s only when you make a $35 transaction and discover that the fees are $15~$20 that it starts to hit home that hey, this is really expensive. Maybe I should be using bitcoin as a SoV instead of a MoE. Overall however, the feedback from the students were positive. The idea is to run this course in Auckland early next year. BANZ is currently working with C4 to have the course content reviewed and made even better and looking at ways to remove the partial bitcoin payment to improve the student user experience. Class size will be an interesting debate. There is a case to increasing the class size to ~20 students (pending demand of course) and providing a more formal training environment which I think will be inevitable. Would be keen to see if anyone has any particular views on this. Thanks once again to everyone who contributed to making this course a reality. Looking forward to 2018!